This recent dinner at Saison was one of the very best meals I have had not just in 2017, but in a very long time. Executive Chef Joshua Skenes and Wine Director Mark Bright have created one of the most memorable dining and hospitality experiences in the United States. Before the evening was over, I was already thinking about when I might be able to return. I can’t remember the last time I felt that way about a restaurant. Saison’s small dining room seats just thirty people in one fluid space that runs from the bar to the open kitchen. A soundtrack heavy on 1980s pop classics plays throughout the evening. There are no tablecloths and no dress code, while service is warm, friendly and unassuming. It is a totally stripped down vibe. That same aesthetic permeates through the food. An avid hunter, Skenes has a near-maniacal obsession for sourcing the very best raw materials money can buy. In the kitchen the approach seems to be about distilling each ingredient, each flavor, down to its purest essence. Vegetables are often slow roasted, like the tomatoes in the ratatouille or the beets I saw gently smoking above one of the stoves. Many dishes incorporate elements of fire. Meats are aged on a very relaxed schedule. Much of this food is deceptively simple in that elaborate preparations and cooking techniques never take center stage. 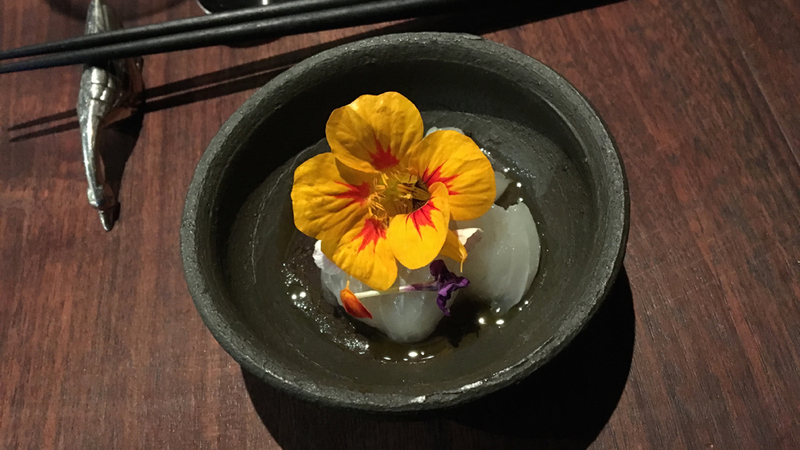 There are no foams, no rich sauces and no overly elaborate garnishes. This food reminds me of power trio bands like Cream and the Jimi Hendrix Experience where the musicians are all virtuosos, but there is a very distinct feeling of spaciousness. Saison's dinner menu is priced at $398 per person. 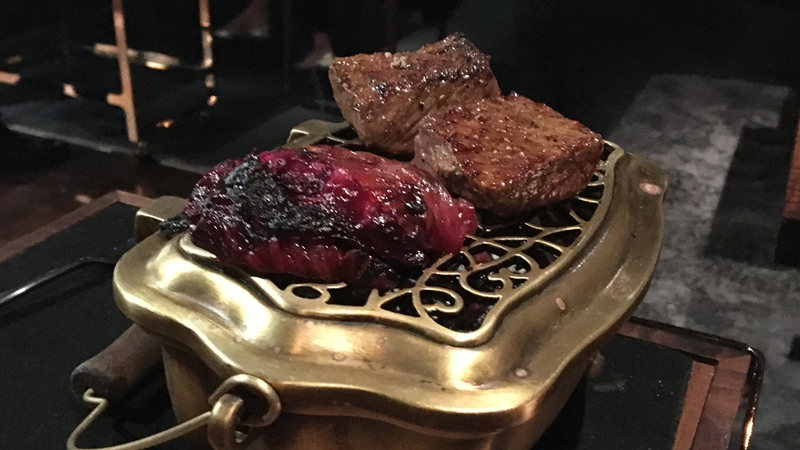 While certainly very expensive, I think I prefer this approach to that favored by other restaurants at the same level that offer tasting menus with supplements. Actually, I am sure I do. Saison is very clear with their policies. After making a reservation, I suggest forgetting about the cost. While supplements for especially luxurious items such as caviar and truffles might offer more flexibility and greater choice, I personally do not want to think about money when I am sitting down for a nice dinner. Saison does offer à la carte dining in the bar area for guests who don't necessarily want to have a full meal. The wine lists, one for whites the other for reds, are vast, to say the least. Alternatively, guests can opt for wine pairings at $298 per person. We decide to let the kitchen cook and ask Sommelier Noah Dranow to pick some wines for us to taste. The corner banquette table closest to the open kitchen is a fabulous spot. As someone who worked in restaurants for years, I love the feel here. There is something about the energy and adrenaline that runs through a kitchen during service that is addictive. From this vantage point, it is easy to watch as numerous dishes are prepared and served. But this location within the restaurant might not be for everyone. The heat from the stoves and ovens is noticeable, as is the steady communication between the chefs. For diners who want to be part of the action, though, there is no better place to be. 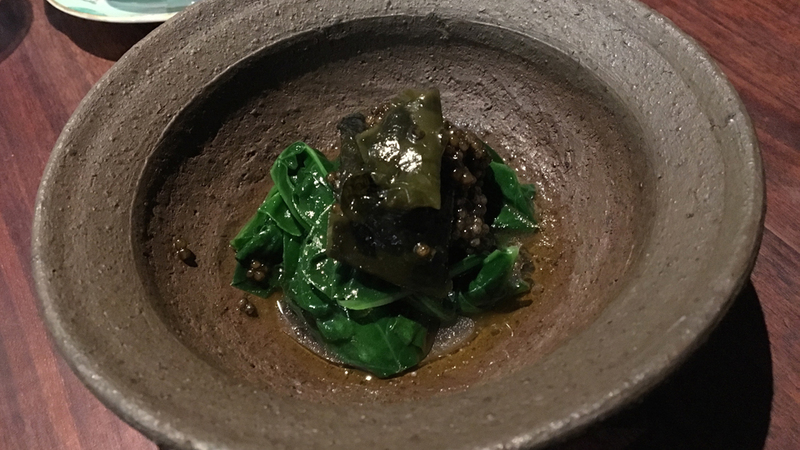 Dinner starts with Saison’s Private Batch Caviar, which is smoked and served atop spinach poached in seawater and seaweed butter. The flavors are bold, intense and totally fused together. The eight months the caviar spends being cured in barbeque salt and layers of nuances from the smoke, along the natural quality of the caviar itself, make for a truly memorable dish. The turbot is served in two preparations; the first is raw, while the second is a more elaborate dish of cured, chopped meat that is placed on a sort of rib cage made from the fish bones. Both are incredibly delicious. California Box Crab is poached in a wild fennel stock, and dressed with vinegar made from the grilled shells. It is one of the more delicate dishes on this menu. 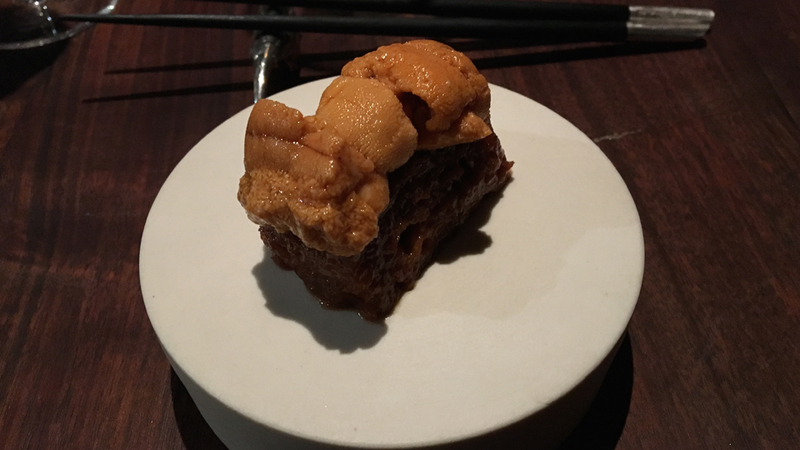 The sea urchin, a Saison signature, is served over grilled wheat bread. It is also fabulous. A sort of deconstructed ratatouille is presented as five separate components: Corn pudding, okra, strawberry mint and tomato water jelly, grilled peppers, fairytale eggplant, purple shiso buds and a dish of fresh and roasted tomatoes. The ratatouille is the most fanciful of these dishes and yet everything works together beautifully. 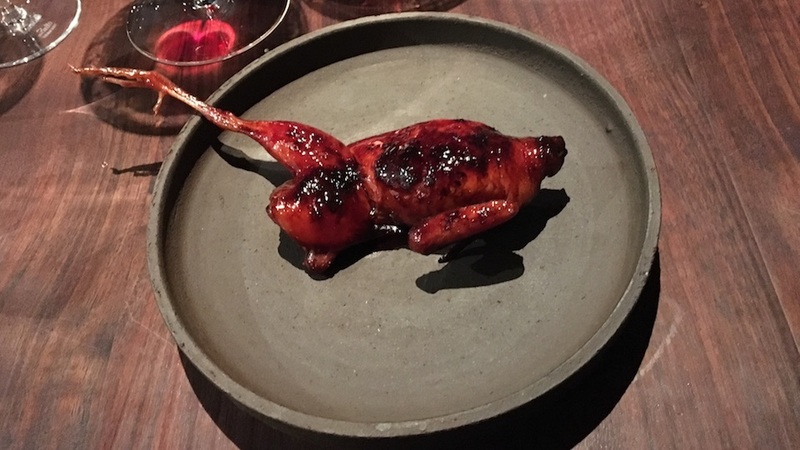 The barbequed quail is tasty, but it would be easier to eat had the meat been cooked a little more. Neither my guest nor I finish the quail. Dinner gets back on track with the grilled antelope and radicchio, which is a perfect example of a dish that is more about purity of ingredients and simplicity than anything else. I am not ashamed to say I devour one of the large biscuits that is served with the antelope. With extra hot sauce. This is comfort food at its best. 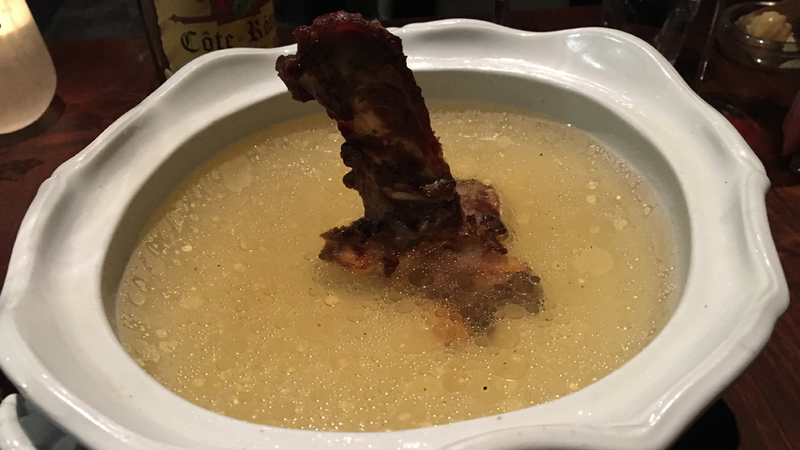 A broth made from the grilled antelope bones is next, and it is delicious, with intense flavors and layers of nuance. Much fanfare is made of the slow-roasted pineapple. I think the same pineapple is shown to every table. Regardless, it is tasty. 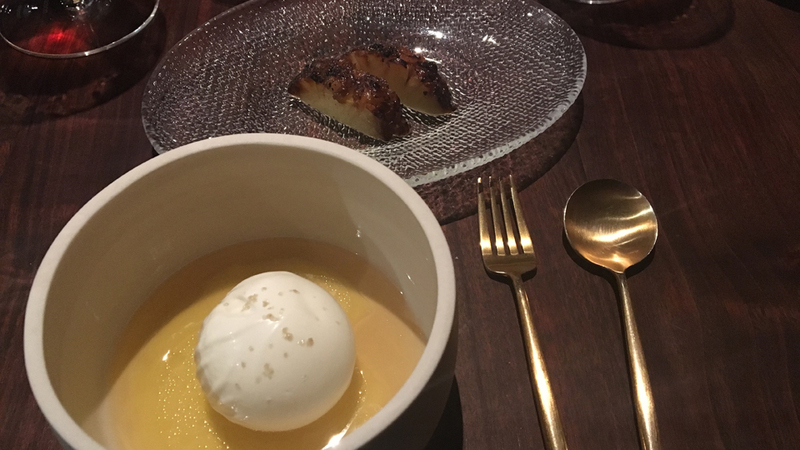 But the smoked ice cream over pineapple soup and coffee oil is even better. A dish of raspberries is a repeat of a similar theme seen in the tomatoes in the ratatouille where a single ingredient is presented two ways, in this case lightly touched with a fragrant syrup, and then sugared. Saison's yuzu creamsicle is both refreshing and the perfect conclusion to this sensational dinner. 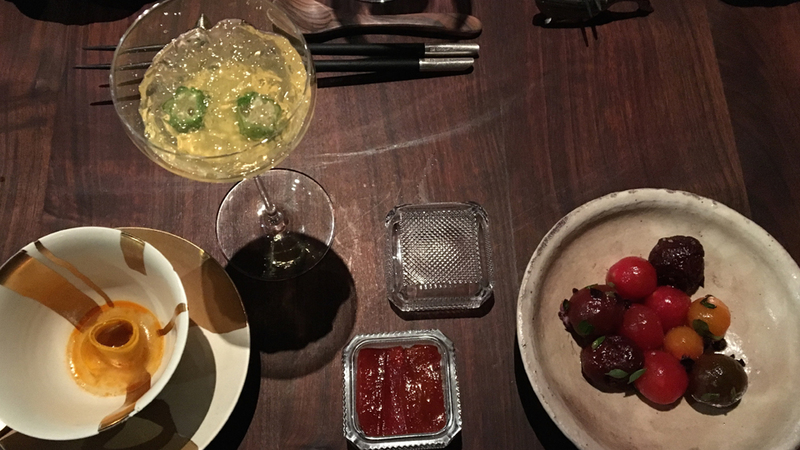 The raspberries and yuzu probably should have either been served together, in the style of the ratatouille, as components of the same course, or sequentially, but with more time in between the two dishes. Instead, they were served in quick succession, which was awkward. But that is a very small, and admittedly fine, point. Marie-Noëlle Ledru’s Champagnes are always big and generous, with plenty of Ambonnay resonance. Her 2008 Brut Nature complements Saison’s caviar course nicely. Personally, though, I would have preferred a more refined, focused Champagne to start this meal. There is so much to like about the Taka’s Noble Arrow. 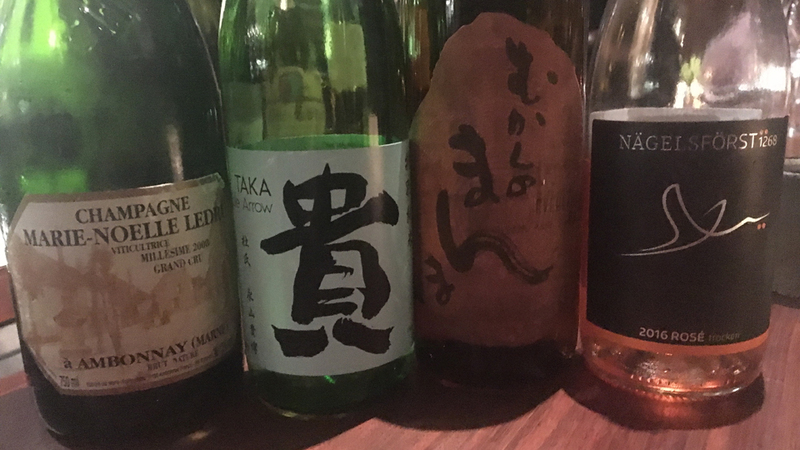 A sake of precision, the Nobel Arrow graces the palate with a striking array of green pear, Mirabelle, spring water and chalky nuances that play beautifully against the live diamond turbot and crab courses. 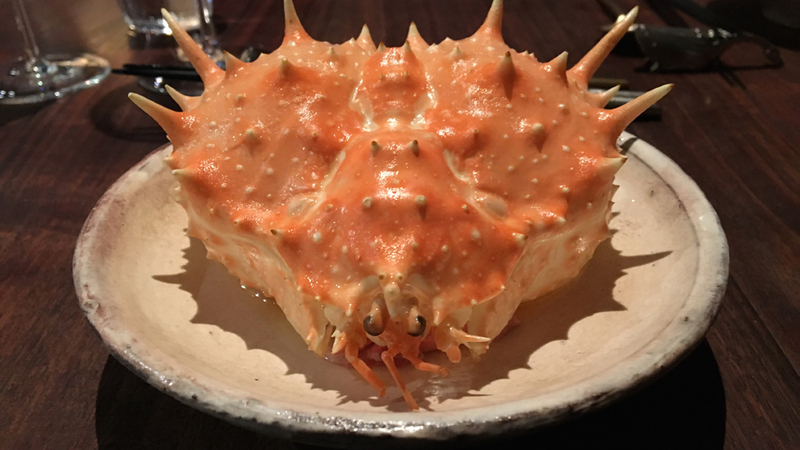 Dranow chooses the much richer, deeper Yamada Everlasting Roots with the Sea Urchin. Here the flavors and textures are bold and expansive on the palate. A lovely, transitional wine, the 2016 Nägelsförst Rosé is very pretty. Silky, aromatic and gracious, the Rosé is an ideal wine for the last days of summer. Served with the ratatouille, it is a real pleasure to drink. 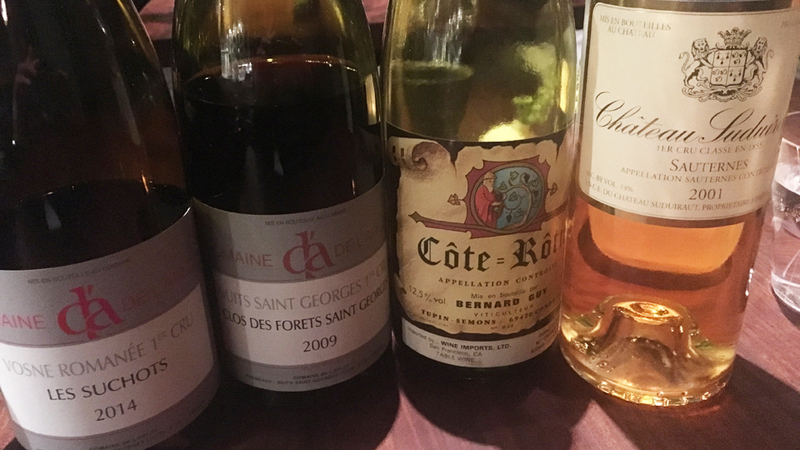 I remember tasting Domaine de L’Arlot’s 2009 Nuits Saint-Georges ‘Clos des Forets Saint-Georges’ with Olivier Leriche, first from an array of different barrels in the cellar, and then from bottle. At the time, the 2009 was a dark, brooding wine. Now, several years later, the 2009 is still quite imposing, but it also shows more brightness and aromatic lift, perhaps the result of the 95% whole clusters Leriche used. Even so, the 2009 is developing at a far slower pace than I originally envisioned. As good as it is today, the 2009 needs another five years or more before it is at its best, but it will always be a typical, chunky Nuits. The 2014 Vosne-Romanée Les Suchots offers quite a bit more charm and finesse. Then again, that is Suchots. Despite being very young, the 2014 Suchots is a pure joy to taste and drink. Lifted aromatics and silky tannins add to the wine's sheer allure. The 2014 Suchots is disarmingly accessible for such a young Burgundy. At times, it comes across as a touch light, but it is undeniably beautiful and expressive, not to mention very nicely suited to the food on the table. Guy Bernard’s 1986 Côte-Rôtie is attractive, but also a bit fleeting. I would have liked to see greater depth. But more than that, stylistically, the Côte-Rôtie is quite similar to the two red Burgundies that precede it, which means the 2001 Suduiraut, a big Sauternes, comes somewhat as a shock to the senses. Ample and inviting, the 2001 is loaded with apricot jam, citrus, honey and exotic floral notes, all in a pleasing, if somewhat burly style that works better with the pineapple dessert than with the raspberry and yuzu courses that follow. We finish the evening at the bar, where Sommelier Thatcher Baker-Briggs prepares two of Saison’s signature cocktails that more than satisfy my newly found craving for rye and bourbon. 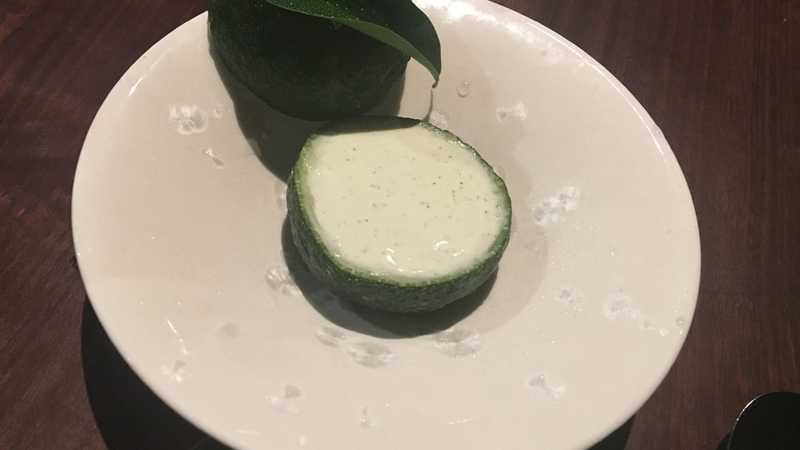 Dinner at Saison is not an inexpensive proposition, but the brilliant cuisine, informal ambience and friendliness of the staff make for an unforgettable experience. It is easy to completely lose track of time at Saison, and that is always a great sign.